On Monday 11 February 2019, GovInn hosted a panel of South African based Nigerian academics, political practitioners and students to discuss the upcoming Nigerian elections. The panel was moderated by Dr Chris Nshimbi, and included members of the People’s Democratic Party (PDP), academics from the University of Pretoria and the University of South Africa, and students who commented on the state of Nigeria leading up to the elections and their expectations. Below is a summary video, from Channels Television, sharing highlights of the event. 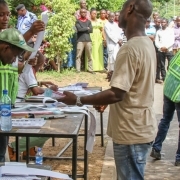 http://governanceinnovation.org/wordpress/wp-content/uploads/2019/02/nigerian-elections.jpg 475 1349 GovInn http://governanceinnovation.org/govinnedev/wp-content/uploads/2019/02/Govinne-logo.png GovInn2019-02-22 06:53:192019-04-02 08:06:01In the Media: "Democracy, Governance and the 2019 Elections in Nigeria: Which Candidate is the Answer?"